We visited Belitung and Bangka on 25th-28th May 2017. We saw some interesting places there. Belitung popular since Laskar Pelangi Film was aired. And Bangka has been popular with their “Kerupuk” (snack which made from fish and wheat). Bangka-Belitung is a name of a province in Sumatera, Indonesia. 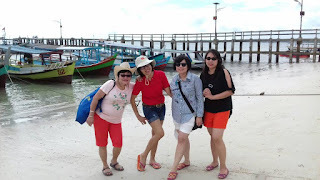 Bangka and Belitung are 2 different islands and we can go from Belitung to Bangka by take 30 minutes flight or 4.5 hours ship. 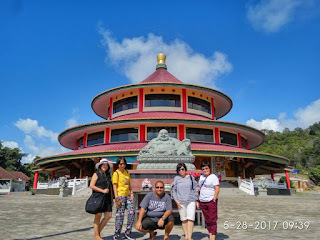 In this article, i will introduced some interesting places to visit. These activities need time from morning to evening. 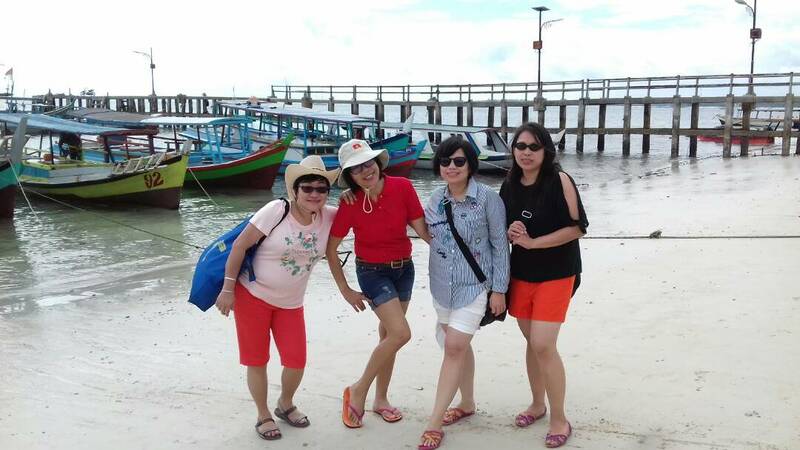 We started this trip at Pantai Tanjung Kelayang by using Traditional Boat. We must climbed wooden stairs to go inside the boat. Not too high but it is not suitable for children and old people. We visited Batu Burung Garuda. Our boat only stopped near this stone because it is not possible to walk there. 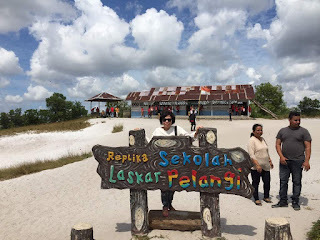 Then, we visited Pulau Pasir. Very very small island that can always be seen. It is depend on the high level of sea water. We only took picture from the boat because at that time was very crowded. Pulau Batu Berlayar was our next stop. We walked around this area and took some interesting photos. 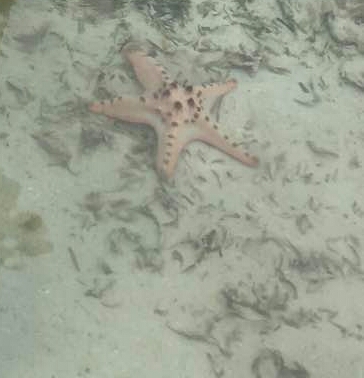 The unique are big stones and starfish. Next was Lengkuas Island that has a 100 years old Lighthouse which made by Dutch. When we came here, the Lighthouse was in renovation process therefore we cannot came in. Here, our boat cannot stopped in lower water. Then we felt as if we were in floaded situation, he...he.... After we ate coconut and waited until the rain stopped, we went to Kepayang Island to have lunch. For me, the best food here is fried banana. That was the last island that we visited. NOTE: please check weather prediction before you do this activity. In the end and the beginning of year, the waves are usually very strong. 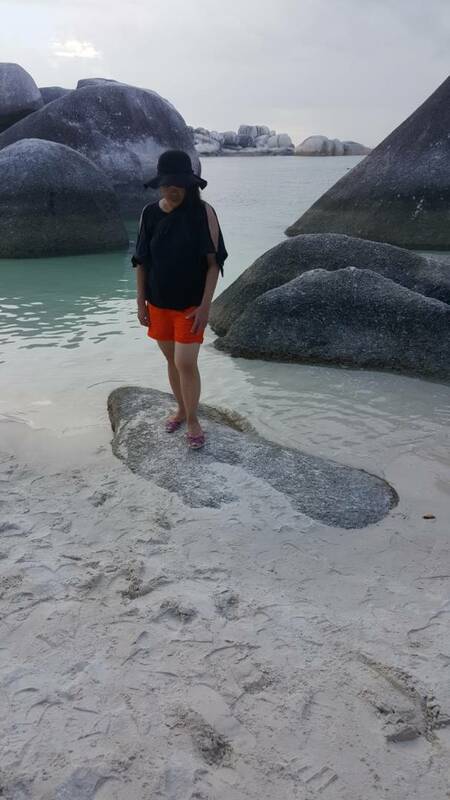 We came back to Pantai Tanjung Kelayang, then we went by car to Pantai Tanjung Tinggi, one of Laskar Pelangi Film spot area. Actually, this is mining area where people take kaolin to make ceramics. The light blue water made this place beautiful but the dust was made us rather uncomfortable. Ahok, ex Jakarta Governour who is loved by many (I say "many", not "all". Why? You can read news about him) Jakarta citizens and also by Indonesia citizens who live in other cities and also countries, was born in Belitung. We can visit his house when come to Belitung. Very very simple school which reflected Andrea Hirata (novelist)’s school. But this replika is not located in the real place because the real school area is still not easy to reach. Simple school combine with dream, seriuosness and pray, made Andra Hirata and his friends can get scholarship to study overseas and get better life. After succes, they did not forget their hometown. Andrea Hirata made a film about his life when he was a child and this film made Belitung popular and tourist interest to visit this place. We must try coffee when come here. Most coffee shop is located in Manggar Area then the coffee is popular by named “Coffee Manggar”. If you want a more comfortable coffee shop, you can visit one of Kong Djie coffee shop. Here, we visited Pangkal Pinang and Sungai Liat area which have some interesting places as below. Here, there is an area which looks like Nami Island. A street with trees in the right and left side. Actually, this area was a lead mining area. After the mining finished, the responsible owner changed this place to become Botanic Garden. This is a Vihara (Budhish Temple) which looked like Temple of Heaven in Beijing. This is located in area which planned as religius area. Now, there is only Buddhish and Hindu Temple. Next will be build Masjid and Church. Here, we also see a beautiful South China Sea view. Here, we can see Replika of Terracota. Although the face of all statue are same (different the original statues in Xian which have different faces), we are happy because we have not yet visited the original. Turtle conservation is the most interesting thing here. The owner of this place is a wooden businessman and he build this conservation by his own money. They take care baby-turtles until 2 years old then they will sent back them to the sea. Mostly "Kerupuk Bangka" made in Belinyu, one area of Bangka which most of the citizens are ethnic Chinnese. We can buy "Kerupuk Bangka" at shops in Pangkal Pinang. One of the biggest shop is Bangka Tradisional Snack, A Yani Street no 59 Pangkal Pinang Bangka www.bangkatradisionalsnack.com. They sell so many types of Kerupuk and also some goods e.g. honey, terasi chili, souvenir: T-Shirt and Batik.